Trying a new descriptor, inspired by SURF and SIFT. Want to use gradient instead of Haar transforms of intensity, but with less dimensionality than SURF. Also don’t need rotation/scale invariance, because using incremental tracking. Here is a sample of image registration with fiduciary marker (actually the marker I used in my games) vs registration with bundle adjustment. Blue lines are points heights (relatively to marker plane) calculated using marker registration and triangulation. White lines are the same using bundle adjustment(modified). Points extracted with multiscale FAST and fitted with log-polar Fourier descriptors for correspondence (actually SURF descriptor produce the same correspondence). As you can see markerless is in no way worse then markers, at least on this example ))). 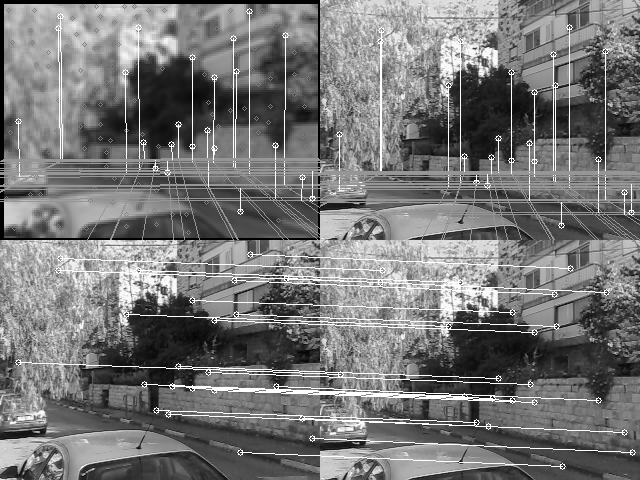 Testing outdoor markerless tracking with FAST/SURF feature detector. The plane of the camera is not parallel to the earth, that make difficult for eye to estimate precision. I did some research on the SURF optimization. While it still possible to make it significantly faster with lazy evaluation, the problem of the scale remain. Fine-scale features are not detectedable on the bigger scale, so it doesn’t look like there is an easy way to reduce search area using only upper scale. If scale-space is not helping to reduce search area it become liability for mobile tracking – range can’t change too fast for a mobile pone, so scale of the feature will be about the same between frames. Will try plain, not scale-space corner detectors now, starting with FAST. I continue to test SURF, in respect to scale space. Scale space is essentially a pyramid of progressively more blurred or lower resolution images. 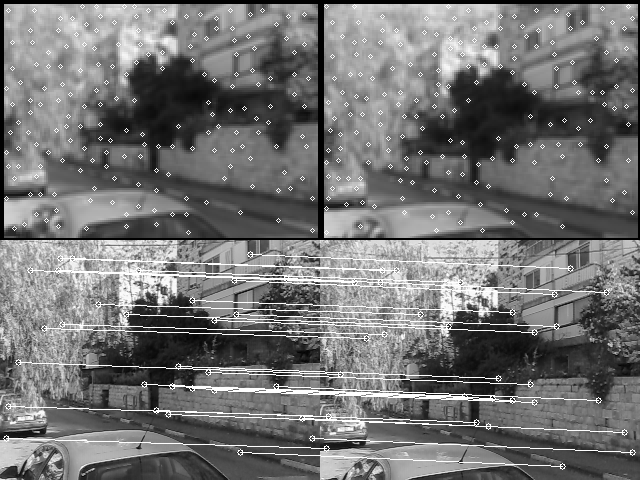 The idea of scale invariant feature detection is that the “real” feature should be present at several scales – that is should be clearly detectable at several image resolution/blur levels. 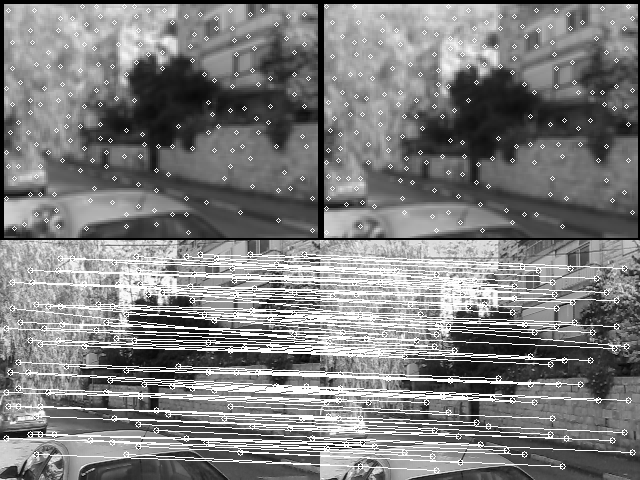 The interesting thing I see is, that for SURF, at least for test images from Mikolajczyk ‘s dataset, scale space seems doesn’t affect detection rate with viewpoint change. I meant that there is no difference if feature distinct in several scales or only in one. That’s actually reasonable – scale space obviously benefit detection in the blurred images, or noisy images, or repeatability/correspondence in scaled images , and “viewpoint” images form Mikolajczyk ‘s dataset are clear, high resolution and about the same scale. Nevertheless there is some possibility for optimization here. I have tested several modification of SURF, using original SURF Hessian, extremum of SURF-based Laplacian, Hessian-Laplace – extremum both Hessian and Laplacian and minimal eigenvalue of Hessian. They all give about the same detection rate, but original SURF Hessian give better results. Minimal eigenvalue of Hessian seems better scaling with threshold value – original Hessian absolute value could be very low, but eigenvalues are not. So this approach may have some advantage if there are potential precision loss problem, for example in fixed point calculations. A lot of high-end mobile phones still launched without hardware floating point so it still could be useful in AR or Computer Vision applications.